When it comes to versatility, sometimes the simpler the better. 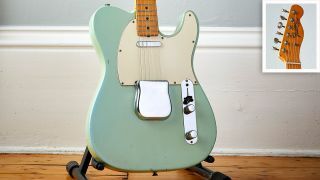 If one were to envisage a solidbody electric guitar in the form of its most essential elements, the likelihood is it would closely resemble a Fender Telecaster, however, back in the 1940s, as Leo Fender’s minimal assembly of insightful ideas began to take shape, the ultimate success of such a concept was far less certain. The Telecaster’s design appears so obvious to us these days that it’s difficult to imagine the guitar having never existed, although that certainly wasn’t always the case. 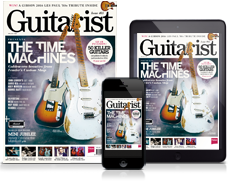 The guitar market has seemingly always encountered opposition to radical ideas and as surprising as it may sound now, the design was initially resisted and even mocked by some following its unveiling at the 49th NAMM convention in 1950. Considered the first solidbody electric guitar to go into mass production, the Esquire appeared in Fender’s Spring 1950 catalogue and was the precursor to the Telecaster. The Esquire could be described as a single (bridge) pickup Telecaster, although early on it was also sold with an additional neck pickup. Fender soon recognised the potential demand for such a guitar and in Autumn 1950 they set about rebranding a dual pickup variant of the Esquire which they named the Broadcaster. The Broadcaster moniker may have stuck had it not been for the swift arrival of Gretsch’s cease and desist letter (since the 1920s, Gretsch had offered a series of Broadkaster drum sets) and for a short while in 1951, Fender simply omitted the model name from the headstock - giving rise to the legendary ‘No-Caster’ guitars of this period. Within a few months, however, the instrument was formally renamed the Telecaster and appeared as distinct from its single-pickup sibling at the NAMM show in July 1951. The earliest Broadcasters/No-Casters/ Telecasters are often referred to as ‘black guards’ on account of their black Bakelite pickguards and are commonly associated with a transparent blonde ‘butterscotch’ finish. A one-piece fretted maple neck with a scale length of 25½ inches and 21 frets was bolted onto a single-cutaway ash body (usually one-three pieces of timber) with a ‘string through body’ bridge assembly housing three adjustable brass saddles to adjust action and intonation. In 1954, the first of the guitar’s major overhauls arrived in the form of a white pick guard, a distinctly lighter blonde finish and steel string saddles, thus marking the end of the ‘black guard’ era of production. In 1955 the design of the bridge pickup was altered from flat to staggered pole pieces and the feel of the necks began to change from a rounded profile into a more pronounced V-shape - on occasion referred to a ‘boat necks’. Over the next several decades, the Telecaster continued to change in terms of looks, sound and feel, although due to its broad appeal has remained solidly in production ever since its arrival at the dawn of rock ’n’ roll. Its ingeniously simple and highly approachable design will no doubt find favour with future generations of guitarists to come.